In developing contexts, street vendors are an interesting issue. They often operate in a grey economy, and don't pay taxes. Without tax revenue, the government cannot fund services. At the same time, street vending offers opportunities for urban subsistence and can help lift people out of poverty. What to do? These are the sort of questions where Find Policy can also be useful. We just added a page on Indonesia. With its nearly 250m people and 17.500 islands, Indonesia is a kind of policy laboratory in Asia. So it's an interesting country to check out. Now if you know Indonesia, you have heard of SMERU. 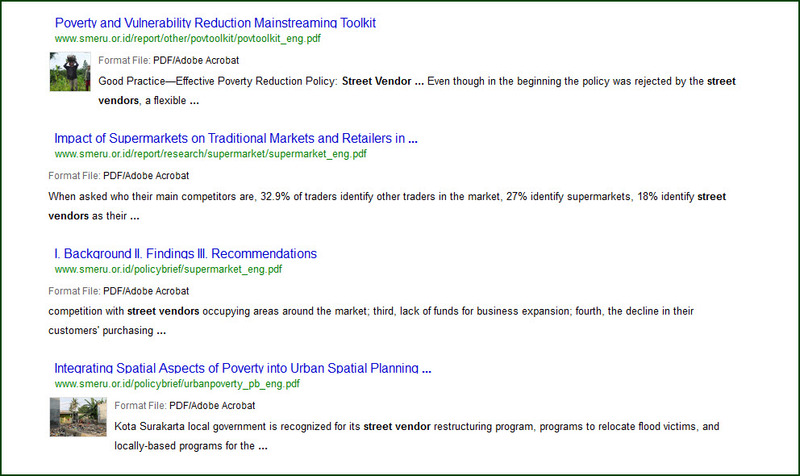 But the point of Find Policy is that you can get good results even if you don't know much about Indonesia so far. We have the engine in Bahasa Indonesia, since we hope it will also be used by Indonesian researchers. Moreover, some institutions do not have an English website. For now we will leave the engine in beta. Do let us know how it works for you. To search the Indonesia page, go here.